Whenever I’m reading, I tend to place a simple bookmark on each page worth noting — circling back (and perhaps illegally) taking a picture with my phone for safekeeping. However, in The End of the Rainbow by Dr. Susan Engel, it appears I’ll just have to download the eBook. Frankly, this work easily ranks near the top of education dialogue I’ve seen. Pages are brimming with research, personal accounts, real classroom experience, and a complete lack of filler. I stumbled upon this book from 2015 randomly in the library, and I’m hard pressed to understand why it’s marginally as popular as a work by Alfie Kohn or Tony Wagner. Coincidentally, despite being fairly short (219 pages), I really can’t summarize every notion below. If you’re looking for evidence of progressive education, accounts of it in action, and a way to open up further reflection on your practice, you’ll need to check this one out. The case-in-point of The End of the Rainbow is that our obsession with preparing students for jobs — whether those be innovative, “future-ready”, or otherwise — is doing more harm than good. Instead, we should primarily care about their well-being, about enlightenment of knowledge. Engel is a professor of developmental psychology, and mirrors her research with the impact it would have on the classroom. Quite obviously, when students are placed first and foremost as people — with care, nurturement, and sparks of curiosity — they’ll learn far more than presenting what they “should know” atthem. By allowing the pursuit of money to guide our educational practices, we have miseducated everyone. We are so hell-bent on teaching disadvantaged children skills (both academic ones, such as reading, and social ones, such as obeying rules) that will lead to a job that we fail to teach them the pleasure of being part of a literate community, how to make their work meaningful, or how to draw strength from the group — skills that might offer them a satisfying life. Just as bad is that middle-class and privileged children are pushed to view every stage of their schooling as a platform for some future accomplishment ending in wealth. This deprives them of the chance to figure out what they really care about, how to think about complex topics with open minds, and how to find a sense of purpose in life. We’re consistently introduced to children, young adults, and post-graduates who fall ill to this system. They’re no longer learning as they did in elementary school — curious, playful, and engaged — rather they’re obsessed with the next step. While some schools focus on control, attempting to ensure that all students learn what’s “needed” on the test (being sure they graduate), others focus on test-prep due to the career opportunities college is deemed to provide. In both circumstances, there is little to no focus on the actual individual — on their pursuits, passions, and love of learning. Engel desires a shift to progressive practices that bolster student interest, which will lead them to understand more. When you actually hear educations discuss the items on that list [collaboration, using technology, public speaking, thinking logically], money is lurking behind every phrase. ‘Students of the twenty-first century will need to be innovators to work in tomorrow’s industries.’..Even goals such as getting along with others are cast in terms of success on the job: ‘Look around. The people who get hired are the ones who can work on a team. These kids need to learn how to collaborate.’ In other words, all of our ideas about what children should be learning are hitched to a sense that a good education can be measured by financial success and that the peril of a bad education is poverty. The bulk of The End of the Rainbow is dedicated to explaining how this obsession with financial success leads to poor outcomes for everyone. In one example, Engel explains how many inner-city “academies” take pride in their “engagement” — noting how a white educator commands mostly minority students to “sit up straight” and “stop looking around the room”, fostering a chilling, but academically-sound classroom according to most teacher training programs. In the upper echelons, she describes her college students’ obsession with money, fame, and power — they refuse to acknowledge that their learning is meant for making themselves happy for the sake of knowing it. Instead, their personal success is entirely dependent on the salary they receive after graduation. …to ask students to spend years and years learning procedures and formulae for some distant goal (like a calculus course they might take in college) that may or may not have meaning to them is pointless. Most children cannot focus on such long-term abstract goals. Conjure up a typical thirteen-year-old, blemishes and all, consumed by various kinds of longing, dulled by the presence of rules and adults, transported by the energy of the group, desperate to feel totally engaged. Thirteen-year-olds who do not see college in their future will do it only in terms of one utilitarian goal — they learn math not to understand it but in order to do well on the test. Again and again I see this in my own classroom and others. College preparation tarnishes the real learning that is necessary to fully understand the relevance of what college should be. Engel constantly demonstrates development psychology studies that presents this irony in education: by embracing progressive practices (e.g. removing grades, promoting PBL, and giving students much more choice), students will learn more than if we drill them with content. Bringing up classic studies such as Elliot Anderson in 1960, who found students were willing to perform semi-meaningless tasks more often when they weren’t paid, or Mark Lepper and Daniel Greene who found that students were more likely to illustrate when there was no reward for doing so. Case after case, learning that inspires more learning is supported by research. Despite the fact that students’ cultural and educational environment encouraged them to emphasize materialistic goals, the students who internalized those ideals the most suffered from the greatest amounts of distress and the lowest levels of well-being. These students were experience a kind of cognitive dissonance: what they were supposed to want did not match up with what they actually wanted. This led to self-doubt, low-self-esteem, and insecurity. When students are encouraged to seek money at the expense of other personal goals such as meaningful work or helping others, they rarely thrive. It seems like that the closer graduation looms, the more the students, teachers, and parents get backed into a narrower and narrower set of goals. As children move through the school system, people tend to give up on the idea that school can teach the abilities that underlie a good life. Expectations of what school can offer become shallower and more concrete. The idea that school can provide a student with a love of books, the ability to think in new ways, and a sense of purpose are replaced with the hope that school can get them into college, teach them a marketable skill, or prepare them for an AP class. What makes The End of the Rainbow different from every other progressive book out there is its accessibility and narrative. It’s not dense, but it’s supported by many pages of research; it has many anecdotal examples, as well as case studies. Also, it presents information in a way most educators will relate with: a brief history of standardization and industrialization, the issues with the intermixing of industry and schooling, and an action plan on how to shift away from it. Unlike most books in this genre, I didn’t find myself skipping large sections due to repetitious phrasing or “same old, same old” — instead, we’re constantly shown subheadings that break up major progressive ideas in an easy to understand way. With the holiday season right around the corner, I recommend this book for any educator — or perhaps a coworker or your child’s teacher. This isn’t a critique as much as it is an inspiration for teachers looking to reignite their passion for the profession. It’s time we restore the purpose of education. 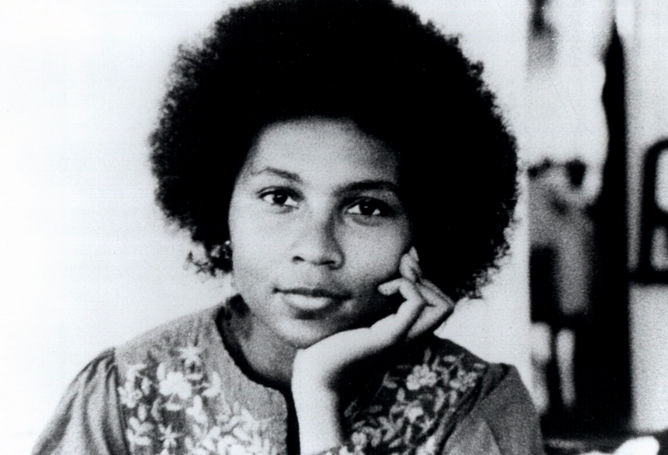 Easily one of the clearest authors on serious issues in the education system, bell hooks has written extensively on feminism, racism, and critical pedagogy. Teaching to Transgress summarizes hooks’ viewpoints through a series of essays which manifest a strong structure for understanding, analyzing, and changing systemic issues. hooks takes complicated concepts and writes acutely, allowing educators to adopt a changed mindset without feeling overwhelmed, targeted, or attacked. An overall theme of Teaching to Transgress is seeing education as a practice of freedom. Inspired by the work of Paulo Freire, hooks believes that a classroom should provide students with the means to escape oppression. Through each chapter, hooks provides various examples of what this entails. To summarize, education is inherently a political act — to remain neutral on challenging the status quo is to take the side of the dominator (the “banking model” of transferring content). To take the side of students by teaching them of systemic issues and social justice, allowing them a true voice, and establishing a learning community, will provide them with the means of empowerment. Much of the book reflects on hooks’ experiences as a professor where she at various points taught English, Women’s Studies, and African American Studies. Often, she is discouraged by the tone, style, and criticisms of the (mostly) white male professors who overwhelmingly represent the institution. Even though these ideas are presented for higher education, they are easy to tie to the K-12 system. Any progressive educator knows the battle of giving teachers the wherewithal to recognize the inherent problems of a passive classroom. I would argue that most do not see “freedom” as a goal of education — rather, most would see school to either A) provide the “baseline knowledge” to succeed in life or B) to prepare someone for a job. However, by changing dialogue to empower — the goal of a classroom changes drastically. No longer are students disciplined for disobeying a teacher’s strive to reach as many standards as possible, they are empathized with, listened to, and learned with to solve real problems facing themselves or others. The true shift from teachers as content deliverers to guides and mentors is a needed one, and Teaching to Transgress argues this point extremely well. Throughout, hooks demonstrates many of Paulo Freire’s ideas as he was an inspiration and mentor. However, as most readers of Freire’s work would understand — his books are complex, academic and sometimes hard to comprehend (especially considering their translated lexicon.) Although it has been criticized, I personally find hooks’ commitment to not using footnotes and simple writing relieving. It is a way for many educators (including myself) to understand these complex ideas with grace rather than struggling after a long school day to decipher Freire’s work. I cannot emphasize enough the importance of an exciting classroom. Nothing is more frustrating than an educational voice who proclaims that students must “grin and bear” or develop “grit” through boring, unnecessary work to make them pass through hoops. Some take this to mean that every class should be a game or jokes should be told — but this misses the entire point. An exciting class is a place of learning relevant information, a place to channel the energy one had as a young child when ideas fascinated the mind and questions were commonplace — and yes, at many times this will be fun. And this can’t come soon enough. I love the terminology of Tye Ripma of REENVISIONED: mortgage childhoods — having students sacrifice who they are now with the goal of possibly doing something in the future (and hope that we don’t have a “housing crisis” of sorts.) The longer teachers wait to implement these ideas, the more the system will weigh everyone down. Flames of passion will die out among teachers and students, and little to nothing will actually change. Educators must band together and demand of their administration — their district — whoever rejects these ideas, that schooling must meet the needs of those it serves. via CNN: this symbolic protest demonstrates the victims of gun violence. In our political climate, it is sadly a risk to use factual information to support social justice — but if we aren’t willing to fight for these causes, what are we truly saying about the point of teaching? If we accept that we “work around” these issues by sticking to a mandated curriculum then we are not fighting for our students — we are sitting at the sidelines. And we must be conscientious of the problems that exist while working to change them. This involves self-reflection, especially among those (such as myself) who come from a privileged white, male, suburban, middle-class background. The idea of “putting oneself out there” — taking risk — isn’t always going to work out the way one expects. It’s so important that we recognize the point hooks is making — that it’s worth trying, even if we don’t succeed. To be scared of mistakes is to reflect the educational structure that most are brought up in — a structure that reinforces one’s ability to succeed entirely dependent on one shot: one essay, a test — all symbolized in a letter grade. To conclude, Teaching to Transgress is a valuable work that should be placed in the hands of all educators. If even a fraction adopted the pedagogy of hooks, our system would see radical, needed change. In a nation that’s increasingly fragmented, violent, and scarily mistreating students — we need more voices that fight for what’s right. We owe it to our students to show compassion, and to love them is to make a change. I always bite my tongue when I hear educators defend the testing industry, even if they don’t outright support it. “Standardized testing is just one tool in the toolbox!” I never wanted to cause argument, perhaps if standardized testing wasn’t utilized as a funding tool — was used for learning purposes of students (and not punishment for everyone else) — it would be useful. However, Making the Grades: My Misadventures in the Standardized Testing Industry by Todd Farley ended any doubts on the fallacy of standardized assessment. Testing like this is not a tool — it has literally zero value to educators, and Farley gives an enlightening, often humorous, account to why. And he has seen a lot. Starting off, Farley was assigned with assessing a 4th grade standardized test prompt. Students were asked to make a public service announcement poster that demonstrated an element of bike safety. In theory — and while being trained — this was quite simple: give students points if they had an element of bike safety present, such as both hands on the handlebars or stopping at a stop sign, otherwise they receive no points. Really, this is just the tip of the iceberg. Testing centers have reliability numbers — test scorers are given the same answers as some of their peers. Their scores must match up at least 70–80% of the time, or else they’re thrown out. What happens when a test scorer is consistently off or the prompt is simply too difficult to assess? Well, the score is manipulated! At many points, Farley demonstrates how managers would either A) change a peer’s number to another’s (whoever they trusted more) or B) just assess the prompt themselves and override the numbers. After his initial assignment, he returns to the agency but fails to meet the 70% minimum requirement entrance exam (where one scores already assessed papers). Soon after, the agency let him in regardless (with a 60%) — and weeks later, many more employees showed up who didn’t make mention of any test. The fact of the matter is that this isn’t a stellar job — it paid $8 an hour and required no experience. Despite systems in place to watch over potential employees (Farley was put on “probation” for not passing initially, but his manager didn’t know what that was), the testing agency was clamoring for anyone to bolster their numbers. This is not the rubric from the book, but you’d be hard- pressed to find a school not assessing in this way. And, with poorly trained employees and really no “why” to the position, manipulation was commonplace. Because scorers were assigned the same answers as a peer (to check their reliability ratings), they were sometimes delivered papers with the previous assessor’s filled in scores. Common practice was to memorize these scores in order, then with your fresh stack write them all down — giving you a healthy break from monotony. 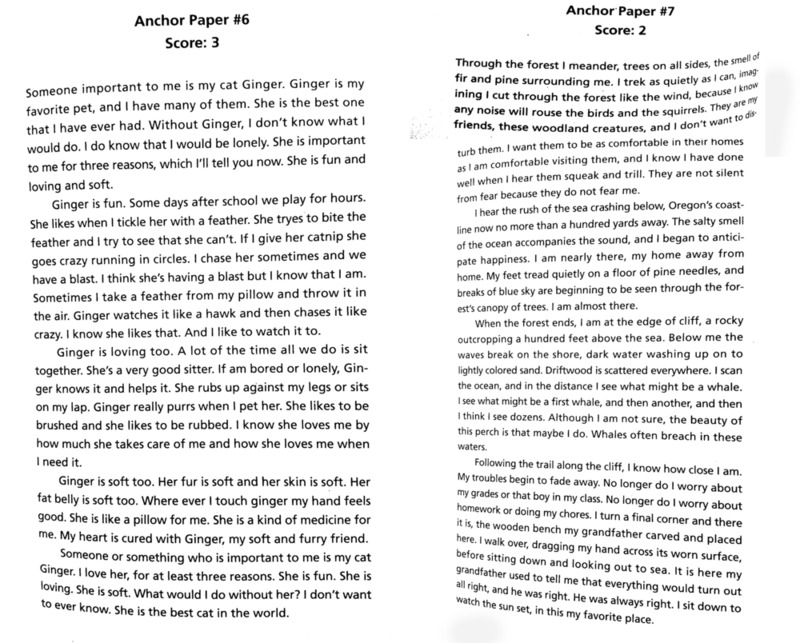 Anchor Paper #6 received a higher score because it is in a traditional 5-paragraph format. The instructions say to write a 5-paragraph response. Within the industry, Farley eventually is a test manager. He accounts how he would often change the scores to the person he trusted. Under him, employees consisted of English language learners, senior scorers (who were never correct, but were there so long that previous managers just never used their scores), and frankly — people who should never be assessing children on an English test. Simply stated, it’s an $8 an hour job — just like your average McDonald’s employee, there usually isn’t a huge amount of concern, effort, or diligence in mindlessly looking at essays. Notably, there was one situation where Farley believed the testing system would work. After realizing none of his team’s scores matched at all, he sat down with another administrator and they were 90% matching. However, he was told this was too accurate — the psychometrics (which again, sounds like something from 1984) showcased that scores should be 70 to 80%. So, they brought in another assessor who made their scoring less accurate. These are just a selection of examples from the book — which explains in a gross amount of scenarios why standardized testing makes absolutely no sense. Let alone the subjectiveness of standards themselves, or the cultural bias that can exist in testing, or that were measure teacher pay and school effectiveness this way — standardized testing can simply not work because it is standardized. People are people. They don’t conform their answers to neat responses — nor would we want them to! Why would we create a system where innovation is inherently impossible? Why would we want students, in the modern age, to all know the same thing? Why would we want them to display their “knowledge” in one day for the entire course of the year? And — most importantly based on this evidence — why would we think that any of this information is relevant in the slightest? In addition, this book should enlighten on why grading makes no sense. Grading is inherently subjective. Yes — a single teacher may be able to grade without bias (despite their current mood, tiredness, liking certain students, being drawn to certain topics/interests, preferring a certain writing style, political-leanings, and more) — but what does that actually mean for a student? That they passed through your hoops? What happens if they go to another class, submit the same paper (or better yet, submit the same paper to you later) and receive a different grade? Are they more or less intelligent? Do they know more or less? If you use them, it’s worth taking a look at those paradoxical rubrics. I encourage any educator — but especially administrators and districts who place any emphasis on standardized testing — to read this book. I would be shocked if someone could read these accounts, dismiss them, and continue to do this to our students. Yes — it’s not easy standing up to the government or the testing culture at large — but we must do what makes logical sense. This isn’t a matter of losing a week to testing — testing has manufactured an entire education system which supports it the entire year. We need common sense decisions which encourage students to learn for themselves, express their creativity, and find authentic solutions to our world’s problems. 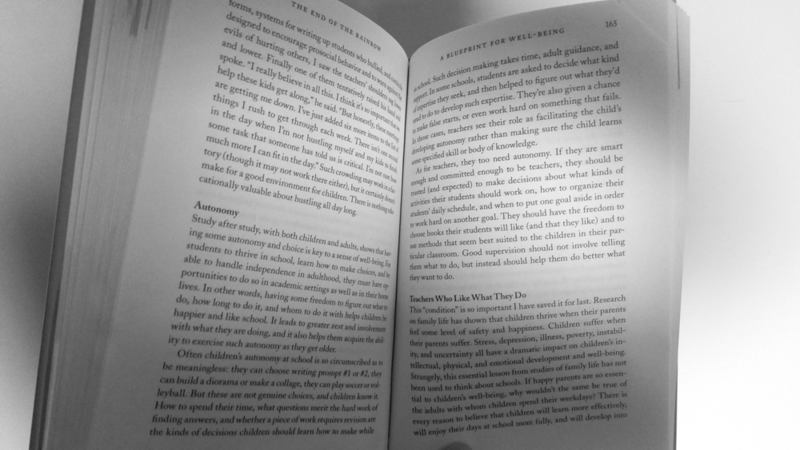 William Deresiewicz’ Excellent Sheep: The Miseducation of the American Elite & the Way to a Meaningful Life is one of my favorite works in education. Exemplifying the issues of prestigious-college seeking youth, our obsession with “being the best”, and what education truly means are just some of the giant ideas tackled. I utilize excerpts of this book every year in my classroom to emphasize the dangers of “next step education” and why we all need to reflect on our lives. Our children spend shockingly little time figuring out what it is that they love to do. They may know what core subject areas they’re “good at” or some professions that have peaked their interests over the years. However, upon even some examination, you’ll mostly find they have done little to nothing in thinking about their futures. Simply asking students, “why do you want to do that?” is often met with, “because I like helping people!” or “because it makes a lot of money!” or “I like science.” Although there must be some starting point, it is heavily concerning that students don’t have concrete, long-reflective answers over a decision that impacts their life’s purpose. Students are lacking any meaning of self in their education. They spend little to no time finding their passions and expel all of their energy on pleasing others. They’re put down assembly lines to be manufactured into STEM graduates, well-paying careers, or whatever field employers say are “in-demand.” Paradoxically, students on these tracks tend to be unsuccessful. A critical point of higher education is that passions inspire learning. Why would I commit to a major that I care little to nothing about? Money and prestige are not enough to awake the human soul. These students that over-obsess on academics never reflect on the real world. They don’t want to appear weak. And in classes everywhere, many assume that our quiet, hard-working, “all A’s” students are doing fantastic — which couldn’t be further from the truth. Of course, all students need help — but we mustn’t forget that academics don’t equate to well-being. It’s concerning that in an effort to personalize learning, we’ve shifted to MOOGs to deliver content. While access to more information is fantastic, we should be very careful to replacing strong educators with delivery systems. Of course, sadly this has become conflated: isn’t a strong educator a great deliverer? In fact, a strong educator should be one who relates with students and guides them on their path — which may involve the use of self-delivered content. Although Excellent Sheep is primarily about college students, it has obvious implications for secondary and even elementary school. High schools have already transformed into college-prep environments. It’s assumed in many classrooms that to succeed in high school is to be accepted into college. That does not mean students are prepared for college. Very little is done about emotional well-being, students have little time to explore passions, at the end of the day, what matters is an “A” in the class. Education has become about moving as quick as possible. Take AP classes in middle school, apply to hundreds of hours of community service in things you don’t care about, take out absurd loans to a program you’ve barely explored, take on a career in a well-paying field because you want to relish in the prestige. However, to truly focus on the self — to care about kids — to make them enjoy their lives — we have to slow down. We have to develop communities: spend large amounts of time on discussion, don’t worry about content or testing, build relationships, mentor students one-on-one, let them look out for each other, and stop preparing always for the next step. When do students get to figure out who they truly are? When do they find out what makes them happy? Where You Go Is Not Who You’ll Be: An Antidote to the College Admissions Mania by Frank Bruni lays out a remarkable case against the ridiculous nature of college admissions programs and the dangerous pathways it leads our children on. Central to the book’s argument is that U.S. News and World Report, as well as other various ranking systems, have tarnished the admissions process and made our students hone-in on the wrong prospects. Of course, most educators are familiar with the errors of these rankings, but Bruni’s work is an all-encompassing destruction of the system, with crushing numbers of tangible evidence against these processes. Bruni outlines the schools with the most Fulbright Scholars (Pitzer, Smith, Oberlin, Pomona, College of the Holy Cross, WIlliams, Occidental, Vassar, Bates, and Bowdoin), as well as study abroad programs for worldly experiences, diverse student populations for more perspectives, those who finance education (not just buildings or salaries), Pulitzer Prize winners, Nobel Prize winners, the majority of successful politicians, the majority of Fortune 500 CEOs — and more in an exhaustive list of factual data. Furthermore, ranking data doesn’t include the quality of education, job placement rates, or happiness. This, in-turn, heavily mirrors school ranking data for secondary schools nationwide, which focuses on standardized testing data and absence statistics above all else. And because our students lack a full picture of this situation, many are being sold on a lie. As stated in the book, these ranking scales: “…unnecessarily shrink the pool of schools that kids consider. In constructing a hierarchy of colleges, they give short shift to the multitude and diversity of them, and they imply that certain schools are better for everyone, when they may only be better for particular students with particular dispositions.” Although Bruni is focused on undergraduate admissions to 4 year universities, this methodology could be applied to any college seeker — including community and vocational schools. 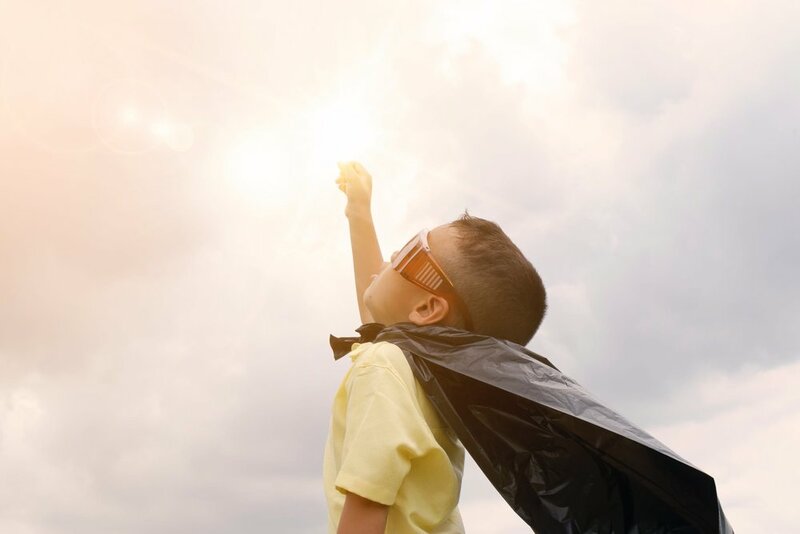 So many students have equated certain experiences and educational systems with “success” — whether that be monetarily or prestige — that they have overlooked where they fit in best to make themselves succeed. That being said, it isn’t all about prestige. A huge factor contributing to this are fear and anxiety. Our society shows increasing signs of income equality — therefore, students want to ensure they’re those that “have” rather than “have-not.” It’s difficult to obtain a job without a college degree — heck, it’s difficult to obtain one with a college degree. With this in mind, many want to ensure employability via an elite education. A narrow pathway envisioned towards success dangers our children’s minds. The story that connected most to me was that of “Matt” — a high school junior that looked perfect on paper to most colleges: stellar SAT scores (with help from an expensive tutor), top of his class, played an instrument, was on the varsity baseball team, a member of almost all honor societies, and participated in 100+ hours of community service. He applied to Brown, Yale, and Princeton and was rejected from all of them. In response, he had an emotional breakdown and sunk into a depression — despite his parents encouraging him every step of the way. They wanted him to be happy. Not only does this connection with elitism showcase a danger to our youth’s psyche, it also demonstrates how students perceive college admissions on their own. Bruni then creates an incredible argument on why public universities are just as great an experience as elite schools — it’s all about the person attending and what they are truly looking for. Taking this introspective look that goes beyond face-value, manipulative rankings, creates a world of opportunity vastly more encompassing than the often-trodden path. For any educator who seeks to inform students about their future, worries about “college prep”, or simply wants a better argument against the U.S. News and World Report — this is a great work to read. Ted Dintersmith’s What School Could Be is a book that makes me feel nervous anticipation the entire time I read: not because of fear — but because the inspiring tone and message are so paramountly on-point that it siphons my feelings as an educator every single page. It makes me want to go into school the next day and forcefully demand education changes for the better. In his book, Dintersmith (co-author of Most Likely to Succeed, another must-read) describes his journey across the United States seeking out best practice. Roughly every three pages, one is introduced to a new school doing something amazing — full of examples, philosophy, vision, and anecdotes. Frankly, I’d be hard-pressed to find a better resource to demonstrate what progressive education is in real life than this book. It’s inspiring to say the least. Although bleak, there is no denying that automation will change our already altered society. We say we’re trying to “prepare our students for the future” in most of our school’s mission statements, but are we really? We can’t necessarily predict which the future holds — but we know that rote memorization and state standardized tests are the complete opposite of what we’ll need. So, what will schools look like if we’re not telling students to “eat their peas and carrots” to make it to college (where, sadly, they are most likely still not being prepared)? Purpose: Where students do actual important work. Essentials: There’s a backbone to what they’re learning that they’ll need in the future. Agency: Students are in charge of their learning and are intrinsically motivated. Knowledge: Everything learned is deep and retained, they are creators and teach others what they know. This is the opposite of what most of our schools are now. Our primary goal is to rank people’s potential to see where they’re at: not necessarily to figure out how to improve. In fact, when one really thinks about the purpose of standardized testing…is it to make our students learn more and address what they’re missing or to punish teachers and schools who aren’t meeting “state benchmarks”? According to Dintersmith (as well as practically any progressive educator), our schools need more hands-on learning. We need to stray away from standardized testing and build activities that matter. We need real-world problems in education. We need to produce graduates that are better prepared than college students for the real world. It’s not that this school is the target of Dintersmith’s wrath — but rather a lasting example of a timeless system of traditional ed. that has spread itself since the late 1800s. It’s not that these schools aren’t pushing for child to succeed — it’s just they’re focused on the traditional definition of “success” — a definition that most don’t question. In a traditional educator’s mind, a school with fantastic test scores and great college attendance rates isn’t doing anything wrong at all. Of course, this assumes that our society needs more people that perform great on tests. The world of tomorrow isn’t going to require (arguably it doesn’t already) the memorization of low-level facts with little to no application, relevance, nor creativity. A large factor of our economy is starting to (and will increasingly) be irrelevant: those who can do processes that robots could do better. Anyone who simply repeats what they’re told and operates in an assembly line fashion will not have anything to do. And, of course, an assembly line world is what our education system is built on: “bell” schedules, standardization, worksheets, and authoritarian rules. Granted, do our students even need traditional colleges? Are colleges simply an extended version of a traditional education system that already is outdated? Most college students don’t obtain a job in their field, let alone a job that requires a college degree. And, so many students in elite colleges are on antidepressants, without a passion in the world. Is this what’s best for the world’s future? Dintersmith makes the claim that high schools need to lead change — not wait for higher education to catch up. Why can’t we educate 13–18 year olds with a better education than colleges can? Dintersmith describes the irony of when school gets more serious, students learn less. Typically, elementary grades are full of boisterous young children that can’t wait to learn. Conversely, high school is a dreaded confinement of jaded teenagers. It’s interesting that we’ve doubled down on making high school work, instead of looking towards earlier grades as an example worth replicating. And this is only in the first twenty pages. The rest of Dintersmith’s work is a categorized experience of every school he visited across the school year. A retelling of best practice in an extended, exemplar form. A heightened sense of awareness is the least one could expect from reading these stories — at most a drive to start one’s own school that actually loves and cares for students. One school featured kindergarten students working with robotics the entire year. Instead of spending huge amounts of time on traditional mathematics and reading worksheets, students simply learned how to operate and create different forms of robotics. One student made a working (albeit elementary, obviously) prosthetic hand with multiple prototypes. Students still learned reading and mathematics (in fact, they learned better according to standardized testing and observation) as everything was applied. 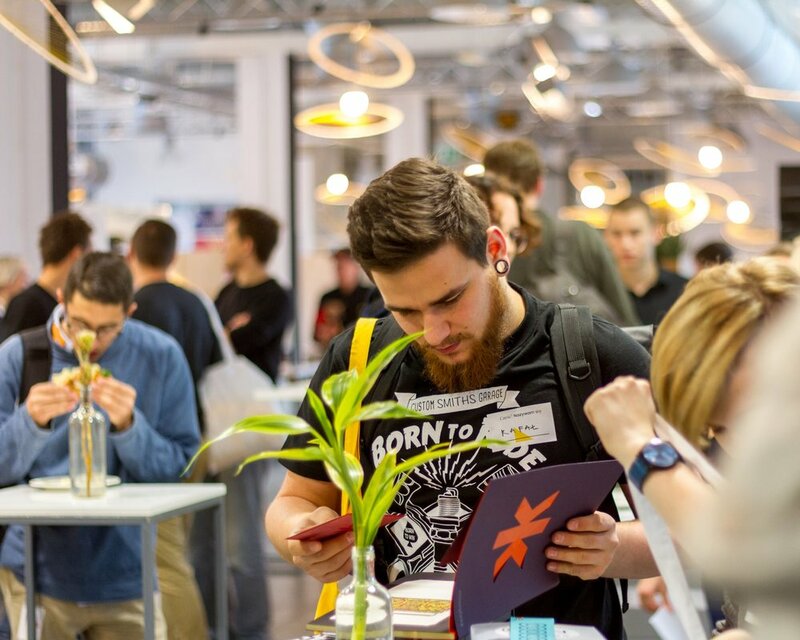 Students demonstrated what they learned at an exhibition of learning at the end of the year: showcasing to over 300 people their greatest successes and failures. And, like most presentations of this nature, there were amazing results and some were not-so-amazing: but that’s completely normal. Our society is so fixated on everyone achieving a simple standardized result, that we’ve forgotten that learning is messy — and all learning will have failure.Incidentally, we offer a resource on getting started on expo nights at your school. Imagine living in a world where people go through their entire childhood and schooling, apply to spend 40+ thousand dollars, and still have absolutely no idea what they’re going to do. Sadly, that’s the reality of most of today’s learners. When visiting one school, Dintersmith was shocked to find students, when asked “what are you interested in?” — Googled, “what should I be interested in?” Why aren’t we engaging student passions!? Shouldn’t that be the entire point of human existence, not just schooling? Also — to continue our shameless plug of free resources, we offer two resources for genius hour: one to start planning it, the other a guide for students to discover and explore. Progressive educators cannot teach within a framework that doesn’t do what’s best for kids. The more a teacher commits to working within the system, trying to make small changes, the more likely they’ll burn out (the hero will live long enough to be become the villain). Instead, we need to embrace change in communities (or tribes) that care about children. Part of that will require educators leaving schools that don’t have their best interest at heart, instead opting for the many progressive schools seeking innovative practice. The teacher’s plan made sense for the community and had wildly fantastic results: students went on to be employed at their own snowboard shops, video production company (from the accompanying documentary), and working in the industry. They took their skills and applied them to career tech to PhD programs — without any traditional curriculum. Every educator needs support from administration that replicates what’s best practice in the classroom. Not only should failure be normalized and a point of learning for students — it needs to be for teachers as well. Relationships aren’t just the prime indicator of success for students and teachers — it needs to be for teachers and administrators too. Students need to be autonomous. They have to be able to manage their time and work without someone looking over their shoulder. Of course, this requires interest and a desire to learn — something not present in the majority of classrooms. Dintersmith introduces Acton Academy — a network of schools who focus on self-directed learning. Students spend the majority of their day preparing, researching, and designing for projects they’re interested in — while performing better on standardized testing (even though it isn’t something they focus on at all). Not present are any textbooks or standard curriculum. We happened to speak to Matt Beaudreau, the founding director of Acton Academy Placer about the importance of self-directed learning. The more our schools are focused on preparing these “perfect students for college” — the more we lose the humanity of our children. The more our schools measure their success by how many students go to college, the more their preached mission doesn’t matter. What matters at the end of the day is college acceptance, and one is only successful if they do. From here, the book shifts to focus on reimagining college (not simply making it cheaper or free — as that still wouldn’t solve the issue of a growing unemployed/unskilled “college class” of young adults) — visiting various community colleges and small schools focused on some of the similar topics found in progressive high schools. 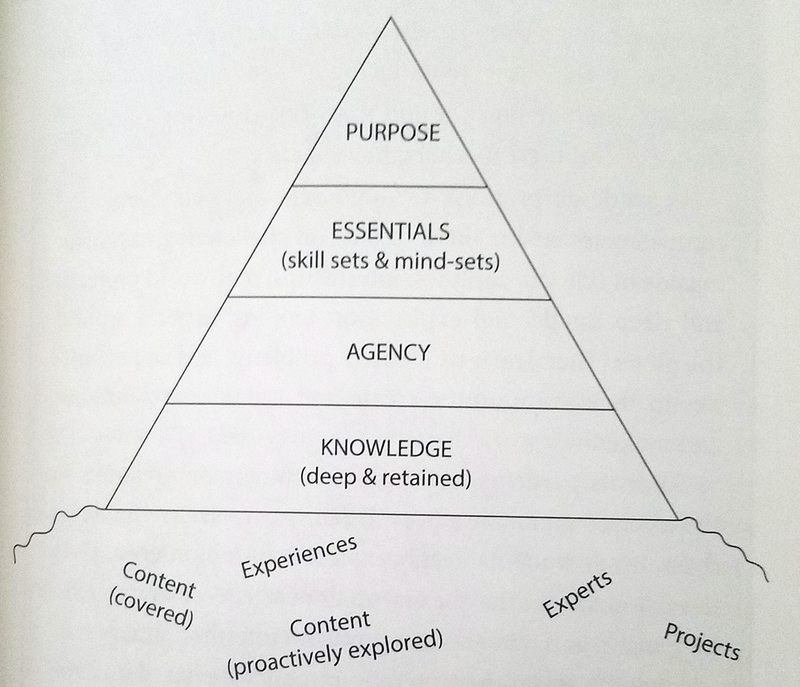 Dintersmith argues that this model should be incredibly similar to how schools operate with their students. Furthermore, an emphasis is placed on social equity in schools and the need for our public schools in lower-income neighborhoods for progressive education. It isn’t just money that these schools need (obviously they do) — but practicing more programs that are truly for a student’s growth. Often, poorer districts double-down on “academic performance” and “rigor” — ensuring that student testing scores are raised — but this comes at the cost as students being less prepared for what they need in their lives — critical thinking, creativity, problem solving. This month features three fantastic works: Originals: How Non-Conformists Move the World by Adam Grant and What School Could Be: Insights and Inspirations from Teachers Across America by Ted Dintersmith. This writing will focus on Originals, additional writings will follow. In Originals: How Non-Conformists Move the World, Adam Grant proposes that the most creative of us — the ones who make and innovative — are those who don’t conform to society’s expectations. As Grant states, “…the hallmark of originality is rejecting the default and exploring whether a better option exists.” Throughout the book, we are introduced to a variety of stories, examples, and research of original thought processes and how they were gained. What’s the treadmill in traditional education? Grades, standardized testing, traditional coursework, and a fixed mindset. There’s a game to be played at school by knowing the rules, doing the bare minimum possible, and rarely questioning what you’re doing. Students are more concerned with achieving rather than learning — failure is not an option, although most learning requires failure, instead students only care about their final grade or SAT score. Of course, all this implies that often the most stressful students for educators are the most creative. In fact, Grant states that adolescents who went into entrepreneurship later in life (a fundamentally creative profession) were much more likely to have skipped school, shoplifted, drank alcohol, smoked marijuana, and gambled. Furthermore, children who had more concrete rules from their parents tended to go into less creative professions. Those who flourished were ones taught a moral framework to live by — how their actions could negatively affect others. Therefore, although these adolescents may have taken risks — they were not any more likely than their peers to drive drunk or buy “harder” drugs. From this, one could surmise that education is not effectively reaching students who don’t fit the norm (school, of all places, tends to be heavily rule focused with no feedback as to why?) And, those teachers who are trying to change the system through progressive thought are often met by roadblocks — whether it be administration, community culture, or fellow teachers. Originals offers sound advice for those progressive educators seeking to change the world. Furthermore, it is shown that there’s a greater risk for those who suggest new ideas very frequently if they don’t have status. That being said, status is earned through power (which tends to be a result of those who make calculated suggestions). This could be viewed as a “Trojan Horse” method of change: make small incremental changes that positively affects learning, gain political power, then start drastically making moves. Because progressive education is viewed as “extreme” by rote teachers — they won’t be willing to accept changing everything just because someone says it. However, they will eventually see the suggestion as legitimate if someone with status and whom they trust mentions it. Overall, we highly recommend checking out Originals: How Non-Conformists Move the World. For a progressive educator, it offers optimism, strategy, and confirmation of the methods we want to impose and dictate. For students, it legitimizes many of their beliefs about the world and questions the traditional narrative we’ve put them on.